Sept. 13, 2018 - Linden’s latest self cleaning double acting step feeders unscramble, singulate and feed logs one at a time using only one moving section activated by two haydraulic drives handling up to 50 logs per minute while clearing debris as it unscrambles and singulates logs. The revolutionary log feeder from the designers of the step feeder, features simple mechanical electric drives which eliminate hydraulics. 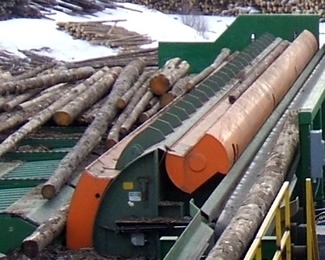 The log feeders ship as a complete unit requiring no assembly. Options include ending systems and laser gap control. Models are available in sizes to suit long lengths from 8ft to 24 ft and log diameters 3 in to 30 inch.